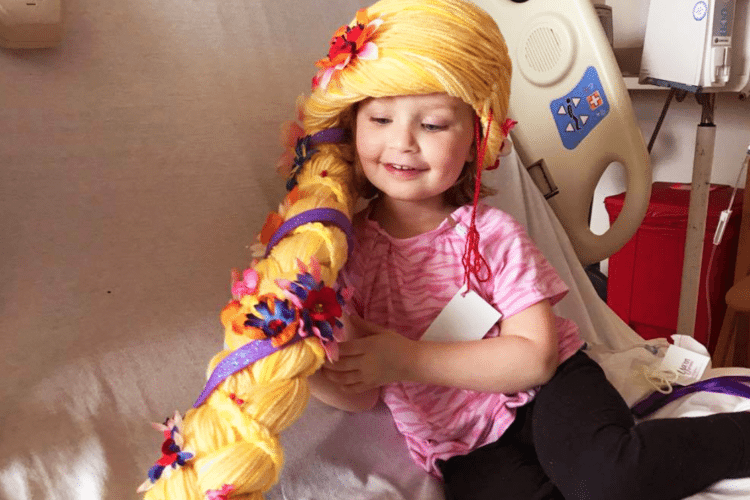 Kids facing chemotherapy are often left with bare scalps that are too sensitive for traditional wigs, which is why two moms from Alaska started the Magic Yarn Project in 2015. The year before, mom and former nurse Holly Christensen had seen her friend’s daughter, Lily, receive a cancer diagnosis. She wanted to help out in some way, so she decided to crochet a Rapunzel-style wig for her. “I knew that Lily would probably have a hard time losing her long, curly hair,” Christensen told TODAY Parents in 2015. “I thought this would be perfect for Lily—something that could comfortably cover her hair and something that could bring a little light into an otherwise difficult time in her life, allowing her to go back into the magical world of princesses and make-believe.” Magic Yarn Project needs your help to keep brightening kids’ days. Hello! Nice to meet you! Since 2012 we are hair to help ;-) Pun intended. We are an spanish wig company placed in Madrid (Europe). In the past 4 years we have developed long-lasting customer relationships thanks to our deep understanding to female baldness, chemoterapy wig solutions and other options. We do so by delivering a differentiated customer experience that generates value for our customers and other companies. The following General Terms and Conditions govern the use of the Website www.europeanvirginhairwigs.com and website sub domains property of Free Style Beauty Solutions SC with Tax Identification Number J86580560, headquarters in Andres Mellado 24, 28015 Madrid SPAIN (hereinafter referred to as, "FS"), provide the following to the visitors of this web site (hereinafter referred to as, "User"). The use of the Website implies full acceptance by the User of all General Terms and Conditions of the Website in effect every time the User accesses the Website. FS reserves the right to amend the current General Terms and Conditions of the Website, as well as any other specific or private conditions, rules, instructions or warnings, whenever it considers appropriate. Likewise, FS reserves the right to suspend, interrupt, or cease to operate the Website at any time. Through this Website, FS allows the access to different materials, information and data (hereinafter referred to as "Material") made available to the User by FS or third-party suppliers of services and materials. FS has the right to change, at any time, the presentation, configuration and location of the Website, as well as the Material and terms and Conditions. FS reserves the right to modify the presentation, configuration and location of the Website at anytime, as well as the Contents and its conditions of access. The User acknowledges and accepts that the access and use to the Websiteand/or the Contents therein is free and under their sole responsibility. The User agrees to make a legal and appropriate use of this Website and its Material, pursuant to the current legislation, General Terms and Conditions of this Website, laws, morality and proper conduct. The User shall refrain from (I) making unauthorized or fraudulent use of the Website and/or its Material; (II) accessing or trying to access resources or restricted areas of this Website, without compliance with the conditions required for such access; (III) using the Website and/or its Material for illicit or illegal purposes, contrary to the terms established in the present General Terms and Conditions, good faith and law and order, to affecting the rights and interest of third parties, or that may otherwise affect, damage or overload the Website or prevent its normal use; (IV) cause damage to FS's physical or logical systems, its suppliers or third parties; (V) introduce or spread viruses in the systems, or any other physical or logical systems; (VI) try to access, use and/or handle data pertaining to FS, third parties or other users; (VII) reproduce, copy, distribute, allow access to the public through any type of media, change or amend the Material, except if the holder of such rights or his/her legal representative authorizes the User to do so; (viii) suppress, hide or handle notices about rights of industrial or intellectual property and other data pursuant to the rights of FS or third parties included in the Material; as well as technical protection clauses or any mechanism of information that may be included in the Material; (IX) obtain and try to obtain the Material through the use of means or procedures different to those means or procedures made available for such effect, or expressly mentioned in the Web pages in which the Material is displayed, or different to those means or procedures frequently used in the Internet to prevent risk of damage or harm to the Web Address and/or its Material. Users willing to establish a link or hyperlink with FS's Website shall obtain FS's previous authorization and be subject to the compliance with the following obligations: (I) the link shall exclusively provide Access to the Website, any reproduction is forbidden; (II) no links shall be established with other pages except the home pagehttp://www.free-style.es using a single browser window to said effect; (III) frames or other means that may imply or lead to the assumption that there is a connection between FS and the website in which the link is included shall not be used; (IV) false, inaccurate or incorrect indications or information about FS's Website shall not be provided; (V) statements or assumptions indicating that FS has supervised or is responsible for material or services offered or displayed on the website in which the link was established shall not be made; (VI) the website with the link shall not display any brand, trade name, company label, denomination, logo, slogan or any signs owned by FS and/or third parties without authorization; (VII) the website with the link shall not have information, images or any other item against the good moral principles or law and order. FS has the right to forbid the inclusion of links to its Website when it believes that the address in which the link was included does not comply with the requirements set forth above. Under no circumstances shall FS be liable for the consequences that may result from the introduction of links by third parties, or any material, information and services offered at the websites in which such links were created. FS reserves the right to reject the admission of hyperlinks to its Website if it considers the website including the link does not comply with requirements, and under no circumstances will be liable for the consequences of introducing hyperlinks by third parties, nor for the materials, information and/or services offered through the website in which the link has been inserted. The User acknowledges and accepts that all industrial and intellectual property rights on the Material and/or any other items included at the Website (including, without limitation, brands, logos, trade names, text, images, chats, audio and video, data base, software and presentations) are held by FS and/or third parties. Under no circumstances does access to the Website grant a waiver, succession, license or partial or full assignment of such rights, except when expressly established otherwise. The current General Terms and Conditions of the Website do not grant to Users any other right to use, amend, exploit, reproduce, distribute or communicate to the public the Website and/or its Material, except when expressly provided for. Any other use or exploitation of any rights shall be subject to the previous and express authorization, specially granted to such effect, by FS or a third party holder of such rights. FS authorizes the Users to use, view, print, download and save the Material and/or items published on its Website exclusively for personal and not-for-profit use, provided that the source and/or author of such material is mentioned ( copyright symbol and/or notes of industrial property of their holders shall be displayed). The use, reproduction, communication and/or distribution of such elements for profitable or commercial purposes are expressly forbidden, as well as any amendments or fragmentation thereto. Previous consent by the holder of such rights, in writing, is necessary for any use other than that expressly permitted. If such rules are breached, FS shall file legal proceedings with the corresponding authorities for the breach of industrial and intellectual property rights. 6.1 Disclaimer of warrantees and liability for the functioning of the Website. FS does not warrantee the availability and continuity of the Website or those websites with which it has established a link. In addition, FS will in no way be liable for any damages that may result from (i) the lack of availability or accessibility of the Website or those sites that link has been established, (ii) interruption in the operation Website or IT failures, telephone breakdowns, disconnections, delays or blockages caused by deficiencies or overloads of telephone lines, the Internet system or other electronic systems produced in the course of its operation pharmahub24.com , (iii) the inadequacy Website for User's needs, (IV) other damages that may be caused by third parties through unauthorized use beyond the control of FS, (V) the presence of viruses or other elements that may cause changes in physical systems or software, electronic documents or files and Conditions. 6.2 Disclaimer of warrantees and liability for the use of the Website. FS is not responsible in any way for the use that Users and / or third parties may make of the Website or the Content, or for any damages arising there from. 6.3 Disclaimer of warrantees and liability for the Contents. FS does not edit the Content posted on the Site by third parties, nor is it responsible for the legality, reliability, truthfulness, accuracy, thoroughness or timeliness of such Content. 6.4 Disclaimer of warrantees and liability for links. FS reserves the right to exercise all available legal actions to claim liabilities derived from the breach of any of the provisions included in the Terms and Conditions and Conditions of the Website by a User. Declaration of any of these General Terms and Conditions null and void or ineffective shall not affect the validity or enforceability of the remainder, which will remain binding between the parties. The waiver by either party to demand at any given time the compliance of any of the conditions set forth herein does not imply a general waiver to the fulfillment of another condition or conditions, nor create a vested right to the other party. The service of the Website and these Terms and Conditions of the Website are governed by Spanish law. Insofar as is permitted by law, the parties expressly waive any other jurisdiction that may apply, agree to submit to the jurisdiction of the courts of the city of Madrid. This is a translation, in case of any discrepancy or dispute, the original Spanish version shall prevail. All items purchased from FS are made pursuant to a shipment contract. This means that the risk of loss and title for such items pass to you upon our delivery to the carrier. FS and its affiliates attempt to be as accurate as possible. However, FS does not warrant that product description or other content of this site is accurate, complete, reliable, current, or error-free. If a product offered by FS itself is not as described, your sole remedy is to return it in unused, unworn condition for the cost of the item. We accept the following methods: Visa, Master Card, Paypal. All credit card charges will appear as “Free Style Beauty”. Our success is your satisfaction! If for any reason you are not happy with the product, you can exchange it, of course! No Restocking Fees! Any balance remaining after your exchange will be refunded to the payment method submitted with your original order. Professional accounts are not eligible for return or exchange. Repackage your item(s) inside the original packaging, and mail it to the address: Free Style – Andres Mellado 24, 28015 Madrid SPAIN within 7 days of receipt of original shipment. We gladly accept returns on all the stock products if you are not happy. Once the package is received and inspected, will be refunded to the payment method submitted with your original order within 3-4 business days. Please note that, depending on your credit card company, it may require an additional 2-3 business days for your credit to post to your account. Please send the product back in factory conditions (unaltered, unworn, odor-free, undamaged, uncut lace, with all tags and in it's original packaging. Products we do not accept: costume wigs, costume toppers, any type of costume hairpieces, outlet wigs or discontinued items, beauty care products, hair accesories, special orders items or professional / wholesale orders. Exceptions: manufacturing faults or mistakes in accesories, costume wigs, costume toppers or costume hairpieces. You will find the product warranty card inside your box. Discounts and coupons are limited to one per order. Free shipping inside European Union countries, 3-5 business days. For other countries: minimum price shipping guarantee. We ship with UPS, DHL, FEDEX or TNT according to your preference. Copyright © 2017 European Virgin Hair Wigs.